Some view the rise of populism – mostly of the right-wing variety – in the EU as a sign that, far from being ready to play a global leadership role, the EU may be disintegrating. But the EU’s situation is much more complicated than the pessimists make it out to be – and not nearly as bleak.WASHINGTON, DC – Europe has a decision to make. It can stand by as nationalism and authoritarianism flourish from the United States (with Donald Trump’s “America First” approach) to China (which is moving from a single-party system to a single-leader regime). Or it can lead a reinvigoration of democratic values and international cooperation, at a time when rapid technology-driven change demands major political, economic, and social reforms. Some view the rise of populism – mostly of the right-wing variety – in the European Union as a sign that, far from being ready to play a leadership role, the EU may be disintegrating. But the EU’s situation is much more complicated than the pessimists make it out to be – and not nearly as bleak. Last autumn, the Special Eurobarometer 467 survey showed that 75% of respondents viewed the EU positively. Though a majority of respondents think their children’s lives will be more difficult than theirs own, two-thirds believe that the EU offers hope for Europe’s youth – an increase of six percentage points from 2016. Young people seem to agree. The share of younger respondents (ages 15-39) who view the EU positively is particularly high. And, despite concerns about the EU’s “democratic deficit,” this cohort seems to appreciate the potential for political participation. Faith in the EU’s future was buoyed last May by the election of French President Emmanuel Macron. If Macron can secure Germany’s cooperation for his European reform program, the EU’s prospects will be strengthened further. While last September’s German federal election didn’t produce such a strongly pro-EU result – the far-right Alternative for Germany is now the largest opposition party, having secured nearly 13% of the vote – the main moderate parties still won the day, gaining more than 60% of the vote. Germany’s new coalition government is at least as pro-European as the one that preceded it, and a stronger Europe could be a fitting legacy for Chancellor Angela Merkel. Italy’s recent election – in which the anti-immigrant League party (with its electoral base in the north) and the left-leaning populist Five Star Movement (whose support is concentrated in the south) together won more than 50% of the vote – is more worrying. Yet, given the antagonism between the two parties, it is likely that a governing coalition that can last will include the pro-European Democratic Party. Ultimately, whatever barriers Italy, with its debt-laden economy, poses to greater EU integration are unlikely to be insurmountable, if France and Germany exercise decisive leadership. Of course, Brexit will not be easy on Europe. But, overall, Europe no longer appears to be a continent in crisis. Even in Greece, which has restored GDP growth, a majority of respondents now supports the EU. In this context, the EU may be facing two related opportunities. Internally, it can adopt reforms that boost institutional efficiency and advance integration. Externally, it can stand strongly for international cooperation, human rights, and open society. Europe must make progress on the first opportunity if it is to seize the second, and that means strengthening the eurozone. On this front, Macron has already offered ambitious proposals: a separate eurozone budget, a eurozone finance minister responsible for it, and a eurozone parliament (composed of members of the European Parliament and national parliamentarians) to hold the finance minister accountable. 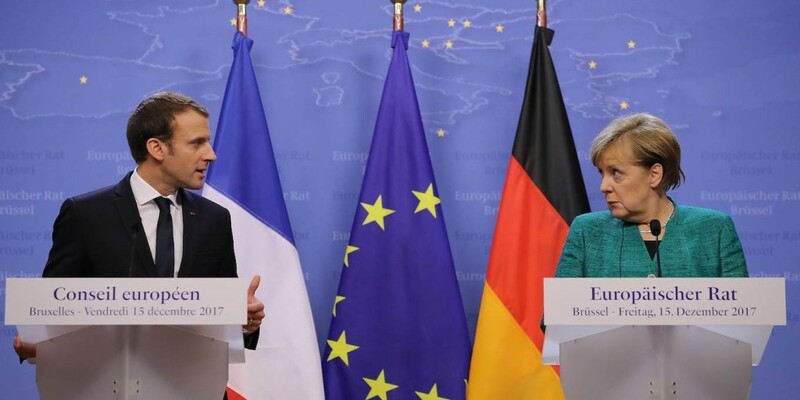 Before Germany’s new coalition government was formed, a Franco-German working group was established to consider Macron’s proposals. Now that Merkel’s new administration is in place, we will find out how far Germany is willing to go in supporting greater eurozone cohesion. In the short run, it seems unlikely that the new government will support Macron’s proposals in their current form. But it may back the completion of the banking union and some mechanism for greater coordination of eurozone economic policies. In the longer run, some of Macron’s reforms should be possible, especially if the eurozone countries are allowed to move forward without unanimous approval from all 27 EU member countries. Such changes – along with more military and intelligence cooperation – will imbue the European project with a new dynamism, spurring more enthusiasm, not to mention a greater sense of security, among Europe’s citizens. A more integrated and secure EU would be well positioned to assert itself more effectively on the international stage. With the European Single Market still boasting a larger GDP than China or the US, the EU can act as the third “pole” in a new world order. Its model of economic openness, social cohesion, and strong institutions can provide an alternative to the isolationist and nationalist tendencies that are threatening global cooperation. And make no mistake: in areas such as trade, climate change, financial-sector regulation, competition policy, and cyber security, international cooperation remains critical. And it will become indispensable as advances in artificial intelligence and biotechnology raise thorny ethical issues that can be addressed effectively only at the international level. The liberal world order that arose from the ruins of World War II to help prevent future catastrophes is facing its most difficult test yet. We must reaffirm the importance of internationalism, openness, and democracy in this new digital age, while adapting our policies and rules to new realities. Europe, with its unique experience of creating a democratic model of supranational governance, should lead the way. The world – especially its young people – is counting on it.